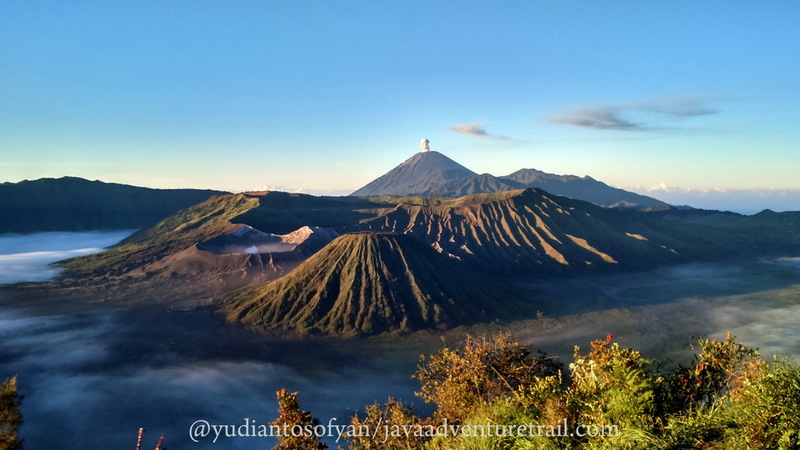 Mount Bromo tour will be started around at 3.30 AM (when you come to Mount Bromo on the weekend, we have to start the tour earlier), the jeep will bring you to the most famous viewpoint on Mount Bromo area. That is Penanjakan hill, from the hill we can see the best sunrise in East Java with mountains and volcanoes as a background. Afterward, the jeep will continue your adventure holiday to reach the sea of sands in Mount Bromo area. We will stop at the parking area then you will cross the sea of sands by riding a horse or on foot (it is optional) till reaching the stairs at the slope of Mount Bromo where it will lead you to reach the peak of Mt. Bromo. After enjoying the volcanic activity on the top of Mount Bromo, you have to go back to your jeep then the jeep will bring you back to the hotel for breakfast, take shower, pack up, loading bags into our car afterward we will continue our trip to your Hotel in Ijen Crater area for about 5-6 hours. In this route, we will pass rural landscape, small cities, rice fields, plantations, and beach. Lunch will be served on the way at the local restaurant. About at late afternoon or in the early evening, we will be reaching your hotel in Ijen Crater area which is only an hour away from Ijen Crater. You will be staying overnight here before you enjoy Ijen Crater trekking on the next morning. Ijen crater tour will be started about 5.00 AM, our car will bring us to the village of Licin and then continue to the slope of Ijen Crater, you will be passing through the plantations and rainforest. This is one of few remaining on the island of Java with giant ferns, plants & big trees. This journey takes approximately an hour from the hotel. Arriving at the parking area of Ijen Crater, about 1 until 1.5 hours will be required to hike Ijen Crater. Along the walking path, you will enjoy the stunning natural scenery with fresh air and bird’s singing. Upon your arrival on the peak of Ijen Crater with an altitude about 2385 mAsl. 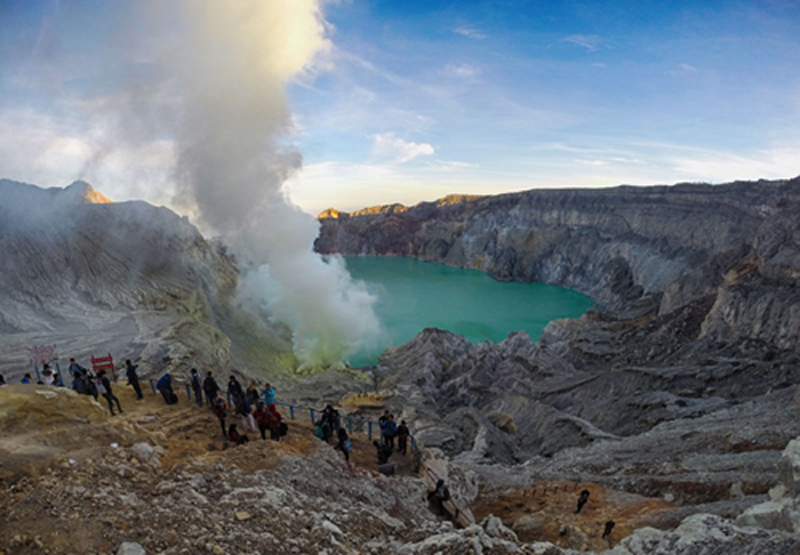 You will be amazed at the enchanting panorama of Ijen Crater; it has the lake of acid water where the water changes to be turquoise color. The view will be so picturesque when you take a photo from above the crater. Besides the view, you will see the sulfur miners where they go down into the crater to take the yellow sulfur rock and climb back up by passing a dangerous path on the edge of Ijen Crater with the load as much as 80 kilograms on their shoulders. If the weather is good enough and you have still good condition, you will have the chance to see the blue flame or blue fire & the sunrise at Ijen Crater but you are required to leave from the Homestay around 01.00 AM or Midnight. Please check the picture of the blue fire at Ijen Crater on the Internet. For further information and booking, please feel free to contact us directly to our Email: Info@javaadventuretrail.com / Whats-app number: +6287755920876 or please fill in the booking form below!